Each year more than 100 million trees are produced for Christmas worldwide. Considering that it takes 8 to 12 years to produce a decent-sized tree, it seems pointless simply to discard this bounty after only a few weeks of using it as ornamentation. I don’t mean to sermonize. I want only to point out that food is everywhere, that a tree is more than a symbol or a decoration: it is delicious food. This year, let’s all butcher the tree. So evangelized Chef René Redzepi in his Christmas Eve Op-Ed piece in the New York Times, giving recipes and ideas on how to use spruce as food. Now, I realize he wrote that he didn’t mean to sermonize, but with that last sentence, it is reasonable to say that he wanted to make converts, therefore I think to say he is evangelizing is perfectly legitimate. Just to be clear. Anyway, at least he made one convert. Me. I have never had any spruce-scented dishes, and with all the verdant and lush greenery that surrounds us here, I thought it would be a perfect tool to use in creating a dish that evoked the Great Northwest. But I don’t ‘do’ Christmas. I didn’t have a tree standing in my living room, ready to be fleeced of its needles for sustenance. Like the chanterelle mushrooms last autumn, I’d have to go foraging for one. It was a few days after New Year’s, and I was strolling down the street toward my local coffee shop when it appeared before me, discarded and forgotten. My newest food source. Should I Strip This Bare Of Needles In Public? I Should. I went back home, grabbed a plastic bag, returned and began to pull needles by the handful into the bag. In broad daylight. Next to a high school. And a Boy Scouts office. Kids walked past with their backpacks. Cars pulled out of the Boy Scouts parking lot and drove past. I was very aware of how strange I must have looked denuding a discarded tree on the side of the road, but thought I would be totally ignored for that very reason. I was correct. Soon, though, my discomfort got the best of me and I felt I had gotten enough. Yet, I returned after dark to get some more. Foolhardy? Completely ridiculous? Perhaps. But I had to keep in the spirit of the opinion piece. Waste not, want not! With my new batch of needles, I went to work. 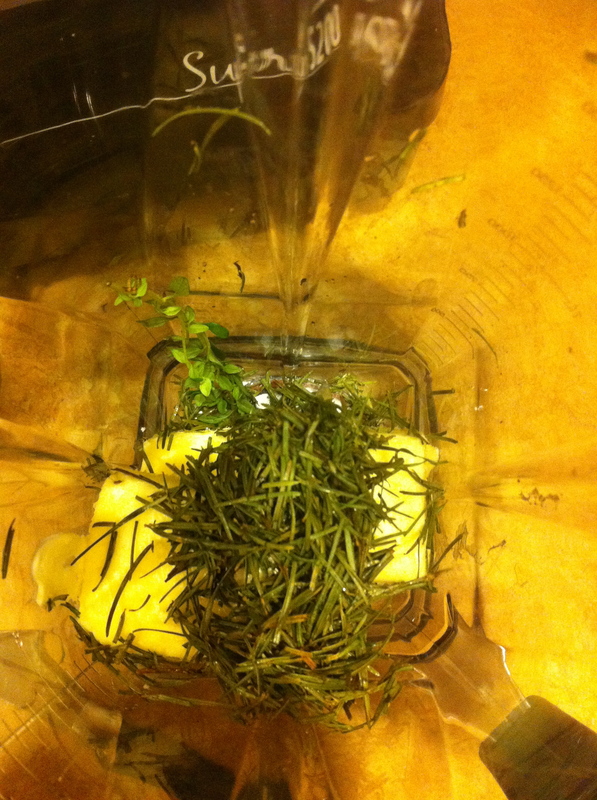 I washed them and threw a few tablespoons in with some butter and lemon thyme into my VitaMix and let her rip. I strained the liquid into a container and threw it in the fridge. An hour later, spruce butter. I’m a frickin’ genius. Wait, no I am not. This one I managed to screw up. The recipe calls for 3.5 ounces of needles. This is a lot of needles! 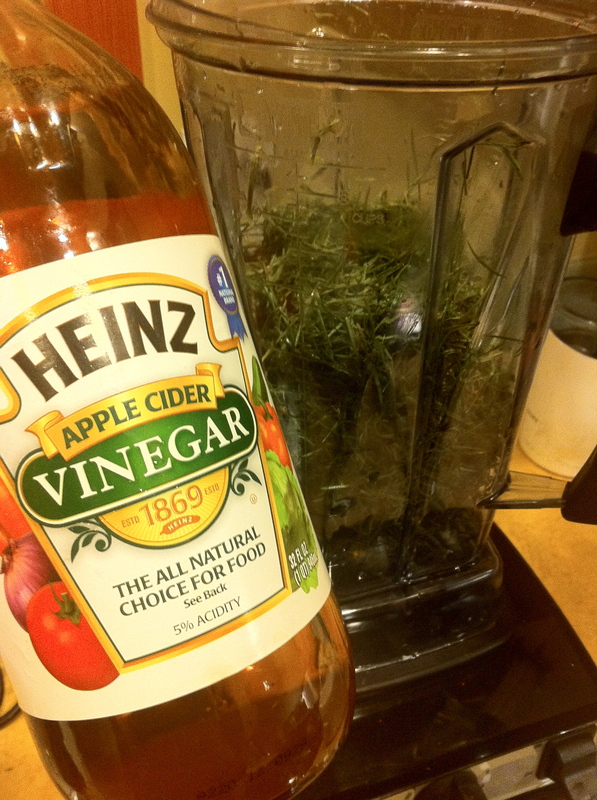 It also calls for 3.5 ounces of vinegar. That’s it? Mm. 3 1/2 oz. of vinegar for that many needles? It was such a tiny amount I went ahead and doubled it. And for my efforts? A little thimble full of spruce vinegar. What a waste of needles! I am NOT stalking my neighborhood for more trees. It’s way after Christmas, anyways. Man. 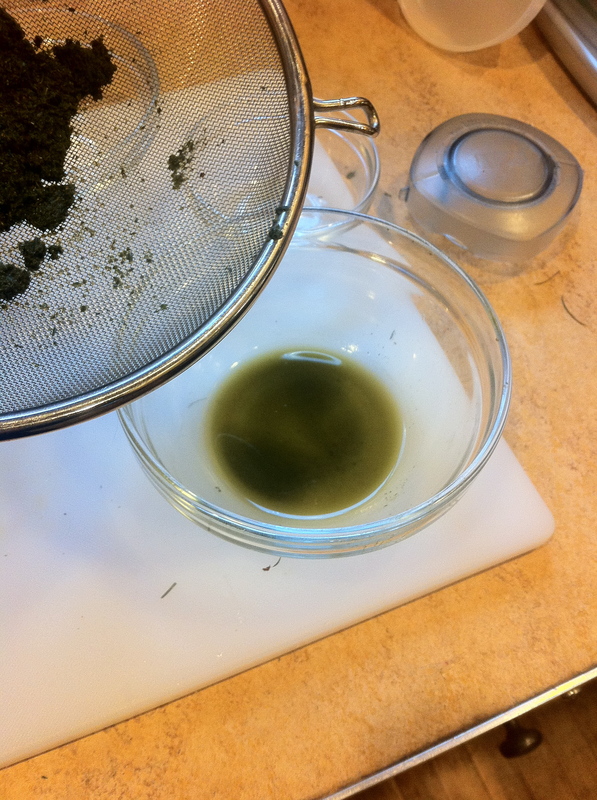 So next up was spruce oil. First, I weighed out my 3.5 ounces of needles and blanched them. 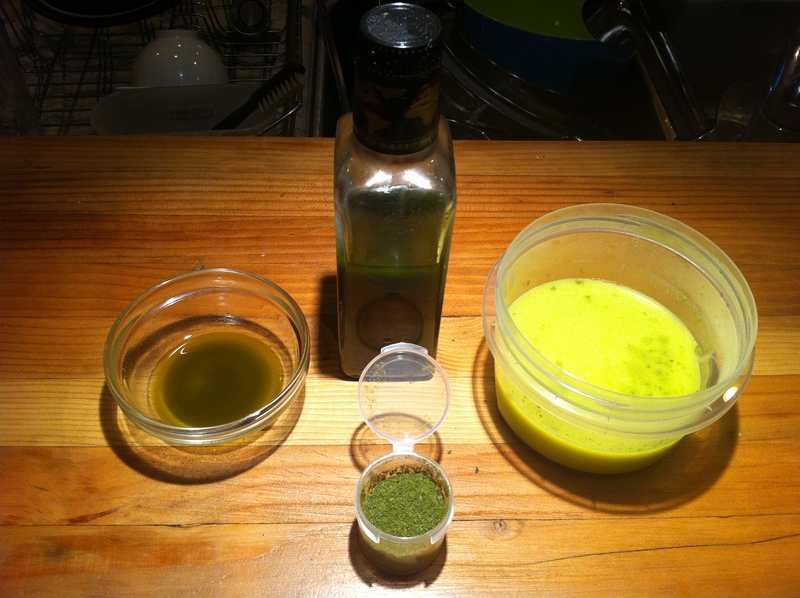 Then I added 1 1/4 cup of grapeseed oil. Wait. 1 1/4 cups. That makes sense. I bet the New York Times printed the recipe wrong for the vinegar. It must have been 1 1/4 cups of vinegar. Ack. If I had done the oil first, I would have seen that and made the adjustment. Ah well. Anyhow, the oil turned out great. I took some needles and grinded them in my coffee bean grinder. Exciting! 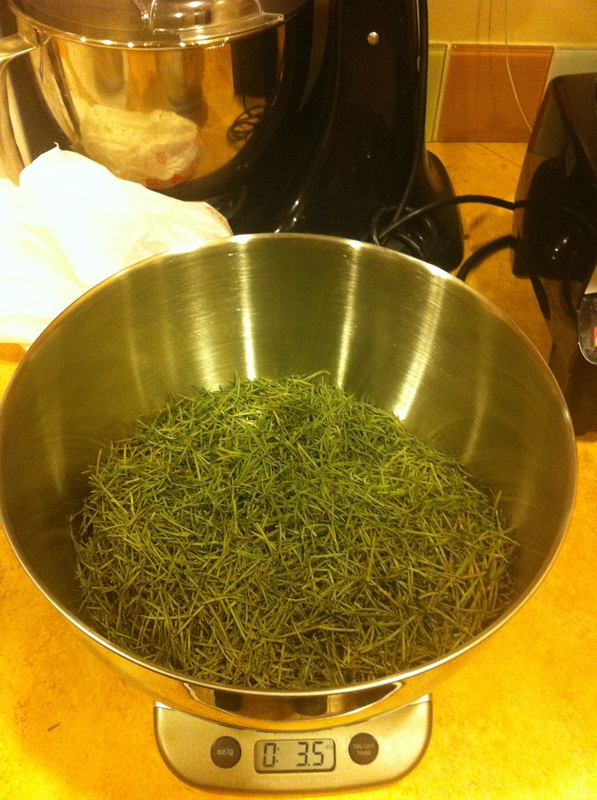 So now I had my spruce ingredients – what to make? I riffed off a couple of ideas some friends had for a dish – pork chops with a sour apple chutney and honey roasted root vegetables. Me? 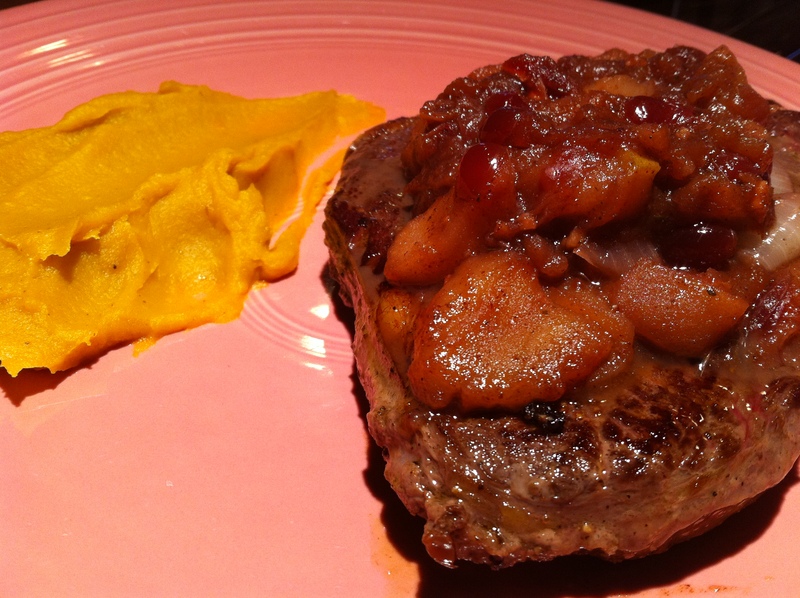 Sous vide bison rib eye with a cranberry spruce chutney and a honey roasted root vegetable puree. Booyah! After cooking this up, I read the comments on the opinion piece and everyone was pointing out how Christmas trees could be covered in flame retardant and who else knows what. I did find mine just lying on the side of the road. Yes, well. I’m still alive so I guess I was lucky. I think a short drive to the mountains would be a better method next time. 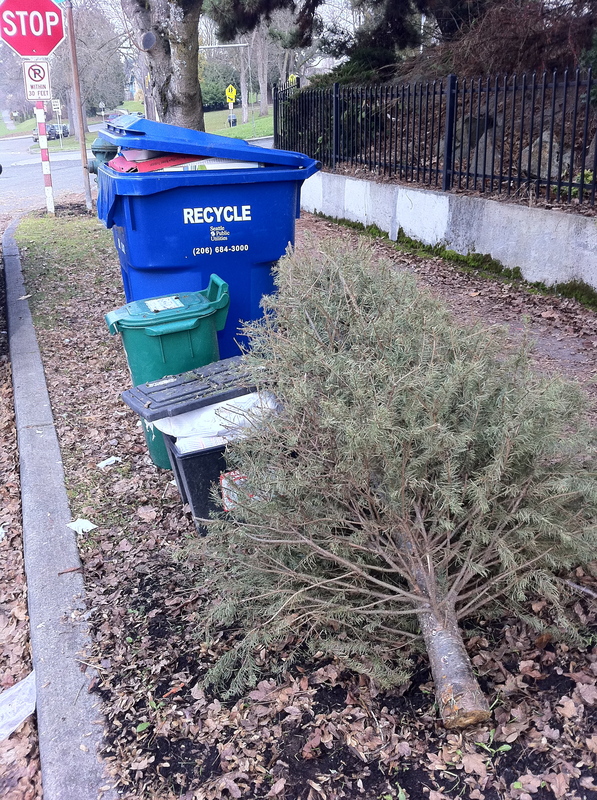 You know, actually, if you get a Christmas tree next year, go cut it down yourself. You never know if you’re going to eat it later. Hilarious and pretty damn awesome. GREAT POST!!!!!!!!!!!!!! Did you accompany your spruce meal with what Greeks call wood nymph tears – Retsina wine? It’s a white or rose wine fermented with pine resin. 3.5 ounces of needles infused in a mason jar of vodka for 3 to 6 months – Absolut Spruce! That’s cool – have to find some for a forest-themed dinner. Spruce vodka is a very good idea – a pine and tonic please!